A member of the Carrot family, along with celery, Fennel differs from them in its strong aroma, owed to its close relation, anise. 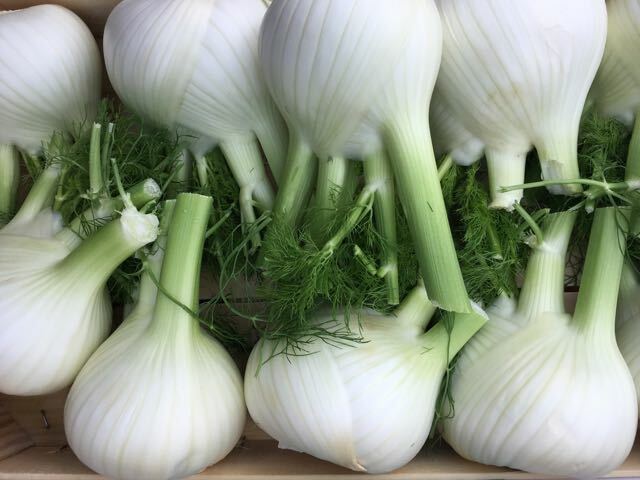 This makes the fennel bulb, also known as Florence Fennel to distinguish it from the feathery herb, a more dominant and less versatile vegetable than carrot or celery. But if you embrace its licorice-like qualities and its lemon notes this crunchy, refreshing bulb can be served from the start, through the middle, and even to the end of a meal. The strength of the anise flavour does vary according to growing conditions and should you want to ramp it up, cooking with a splash of Pastis or some crushed fennel seeds does the trick. The outermost layer of the bulb is always tough, as are the stems, but both are good used in soups and stocks. Any frondy tops can be used just as you would use the fennel herb. The bulb can be eaten raw or cooked. In Italy, Florence fennel is sometimes served raw at the end of a meal just as you might serve a piece of fruit. 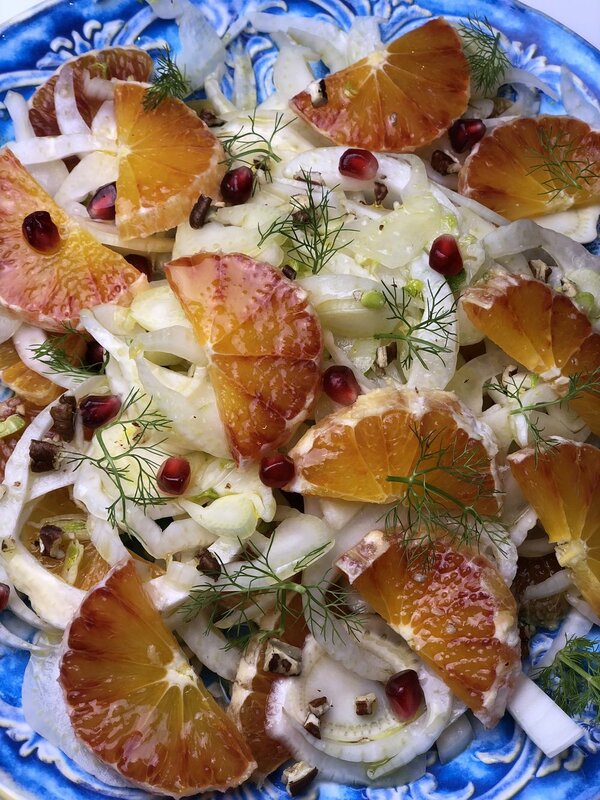 Fennel and orange is a typical Sicilian combination that is perfect for the winter months as crunchy Florence Fennel bulbs come through our doors along with crates of new season Sicilian oranges. A salad of thinly sliced crunchy, aromatic fennel, sweet oranges sliced or segmented, and salty, fleshy black olives is classic. There is a recipe in Rachel Roddy’s book Two Kitchens: Family Recipes from Sicily and Rome for this salad, where she mentions that sometimes sliced red onion is added or pomegranate seeds could be considered for extra acidity and visual allure. Florence fennel also ferments particularly well. Quartered Fennel bulbs can be baked or fried in butter until just coloured, then covered and cooked with a little lemon juice until tender. Cover with parmesan or a 50/50 mix of parmesan/breadcrumbs, and pop in a medium-high oven until the topping is golden; the bulbs are very good simply sliced and braised in some olive oil and a little water, cooked lid-on until tender then lid-off until the liquid evaporates. Serve with fillets of fish, like sea bream or sea bass - add to the fennel pan if you like, cover for 5 minutes before turning the fish and cooking for a further 2-3 minutes; Claudia Roden, in her book The Food of Italy, suggests simply boiling trimmed and quartered fennel in salted water until tender (not floppy), then drain, transfer to a buttered oven-proof dish, sprinkling with salt, pepper parmesan and double cream and bake at 200C for 15-20 minutes until golden brown – delicious alongside roast chicken. In Tim Siadatan’s Trullo: The Cookbook there’s a simple and tasty recipe for Braised fennel and purple olive dressing which introduces a hint of anchovy and a little chilli heat to the dish. Brindisa: The True Food of Spain book has a recipe for Vegetable broth with salt cod and fennel. The bulb also makes a satisfying cream of fennel soup or an aromatic risotto. And in Peter Brears Cooking and Dining in Medieval England you will find Sops in Fennel – sliced fennel, finely chopped onion, olive oil, salt and a little cinnamon simmered for 30 minutes until soft then poured over thick slices of toasted white bread. Returning to the theme of fennel as an end to a meal, the chef Florence Knight, in her book One: A cook and her cupboard, gives a recipe for candying slices of fennel and serving them with chocolate sorbet.